There are 30 Assisted Living Facilities in the Libertyville area, with 3 in Libertyville and 27 nearby. The average cost of assisted living in Libertyville is $4,170 per month. This is higher than the national median of $3,346. Cheaper nearby regions include Grayslake with an average starting cost of $3,975. To help you with your search, browse the 186 reviews below for assisted living facilities in Libertyville. On average, consumers rate assisted living in Libertyville 4.3 out of 5 stars. Better rated regions include Vernon Hills with an average rating of 4.3 out of 5 stars. Caring.com has helped thousands of families find high-quality senior care. To speak with one of our Family Advisors about assisted living options and costs in Libertyville, call (855) 863-8283. Promotion ends in 98 days! Libertyville is a vibrant village located 20 miles south of the Wisconsin border. With a historic downtown, 400 acres of parks, 25 local shopping centers and nearly 100 restaurants, there is no shortage of recreation in this far north Chicago suburb. Seniors make up 15.5 percent of the population in Libertyville, and there are three assisted living communities to choose from should they need support with personal care, medication management or daily activities. There are an additional 42 assisted living facilities in the surrounding area. In Libertyville, and all of Illinois, assisted living facilities are overseen by the Illinois Department of Public Health. Libertyville experiences all four seasons, with weather conditions ranging from pleasantly mild to miserably humid—or cold. In winter, Libertyville averages 41 inches of snow, and the daily highs are often below freezing. Venturing outdoors between December and February can be a challenge. Indexes show the cost of living in Libertyville is 40 percent higher than the national average. However, the biggest factor in this statistic is housing, as real estate in Libertyville ranks among the most expensive in America. The cost of living for groceries, health services, utilities and transportation remains on par with national averages. There are three Metra train stations in Libertyville that offer rail service north to Fox Lake and Antioch, and south to Chicago Union Station. Pace also provides bus routes along Highways 45 and 21, plus curb-to-curb Dial-A-Ride service to give seniors broader access to medical facilities, education, shopping and jobs in the Lake County area. Libertyville has plenty of arts and culture for seniors to enjoy. There are three museums in town, including the David Adler Cultural Center, which provides art and music classes, concerts and exhibitions every week. Libertyville also hosts 50 special events each year, from Village Band concerts in the Cook Park rose garden to the Libertyville Farmer’s Market on Main Street. The Libertyville area is home to world-class medical facilities, including the Advocate Condell Medical Center, in the event of medical emergencies or illness. Libertyville has an array of community resources for seniors, including the Libertyville Senior Center, which offers education, exercise, health services, crafts, day trips and weekly dinners at the Libertyville Civic Center. Assisted Living costs in Libertyville start around $4,170 per month on average, while the nationwide average cost of assisted living is $4,000 per month, according to the latest figures from Genworth’s Cost of Care Survey. It’s important to note that assisted living rates in Libertyville and the surrounding suburbs can vary widely based on factors such as location, the level of care needed, apartment size and the types of amenities offered at each community. 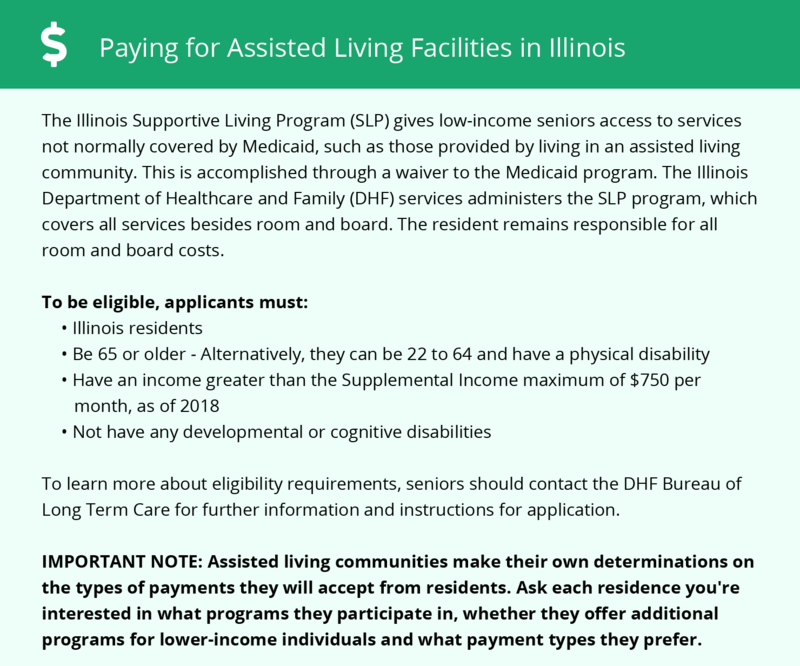 In Illinois, the HCBS Medicaid Waiver for Supportive Living Facilities provides financial support to help pay for care services in some assisted living facilities but not room and board. Libertyville and the surrounding area are home to numerous government agencies and non-profit organizations offering help for seniors searching for or currently residing in an assisted living community. These organizations can also provide assistance in a number of other eldercare services such as geriatric care management, elder law advice, estate planning, finding home care and health and wellness programs. To see a list of free assisted living resources in Libertyville, please visit our Assisted Living in Illinois page. Libertyville-area assisted living communities must adhere to the comprehensive set of state laws and regulations that all assisted living communities in Illinois are required to follow. Visit our Assisted Living in Illinois page for more information about these laws.